Cost: Pre-Sale only Adults 21+ $20 Best Cinco Ever Passport 2 Fun includes: • Event Entry (re-entry allowed with proper id) • 1st Sangria OR Beer • Live cultural entertainment,3 Bands & DJ • Mariachi Light Show • Happy Cinco Hour • Latino Food available • Drink Specials …all the BEST Wealthy Street businesses have to offer! Pre-Sale only Adults 21+ $50 VIP Best Cinco Ever Passport 2 Fun includes: • $15 in food/drink tickets • Rapido VIP Line for shorter wait times and event re-entry all day with proper id • VIP Event Areas • Commemorative Cinco light up drinkware, less waste helps us all be kinder to the environment! 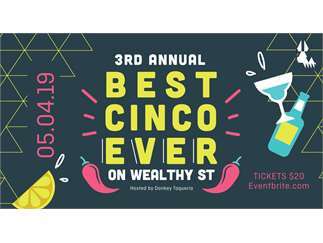 • Entry to win Pinata time • Entry to win Donkey Taqueria 4 a year • Event Entry (re-entry allowed) • 1st Sangria OR Beer • Live cultural entertainment,3 Bands and a DJ • Mariachi Light Show • Happy Cinco Hour • Latino Food available • Drink Specials …all the BEST Wealthy Street businesses have to offer!